Once the Anglican church of British royal governors, then Episcopalian	church of Boston's great personages, this dark granite mass is now a Unitarian meetinghouse. 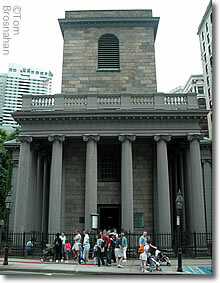 The Church of England congregation of King's Chapel was gathered here at the corner of Tremont and School streets (map), a half-block northeast of the Old Granary Burying Ground, in 1686. It occupied its first meetinghouse on this site, a small wooden structure, in 1689. The present stone meetinghouse, designed by Newport RI architect Peter Harrison and built of granite from Quincy MA, was finished in 1754. It's a stop on the Freedom Trail. The chapel bell, originally cast in England, was recast by Paul Revere to mend a crack, and rehung in 1816. In 1783 Harvard graduate James Freeman became King's Chapel's minister, and introduced Unitarian principles to the worship service. 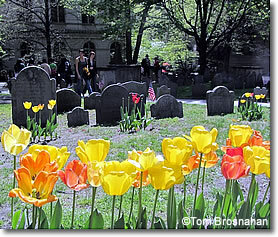 Spring in the Burying Ground. Today King's Chapel continues in the Unitarian tradition of non-creedal Christian worship, using a modified version of the Anglican Book of Common Prayer. Sunday worship is at 11 am, and there is a Wednesday prayer service. In the Chapel's Burying Ground (cemetery) are the graves of John Winthrop (1587-1649), first governor of the colony of Massachusetts Bay, and many of his family, as well as other Boston notables. King's Chapel, on Tremont Street near the Omni Parker House Hotel just off Beacon Hill in Boston MA.